The retina lines the inside of the back of the eye and acts like a film in camera. It creates images that are then sent to the brain via the optic nerve. 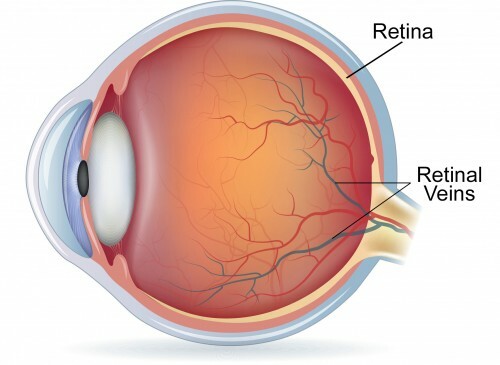 What Are the Retinal Veins? Retinal veins are responsible for circulation of blood in the eye. The veins move blood away from the eye toward the heart. Retinal vein occlusion causes an interruption, or blockage, in normal blood flow. This blockage prevents blood and other fluids from passing through, leading to leakage. This can cause swelling, which affects the macula (the responsible for the vision that is necessary for daily activities), and can result in blurry and/or distorted vision. How Can Retinal Vein Occlusion Be Treated? Retinal vein occlusion can be treated with laser surgery and/or drug injections, such as Lucentis. LUCENTIS is the first FDA-approved medicine to treat wet age-related macular degeneration (wet AMD), diabetic macular edema (DME), and the 2 forms of macular edema following retinal vein occlusion (RVO): branch RVO (BRVO) and central RVO (CRVO). LUCENTIS was approved by the FDA in 2006. It was the first anti-VEGF to be approved to treat wet AMD, DME, and the 2 forms of macular edema following retinal vein occlusion (RVO): branch RVO (BRVO) and central RVO (CRVO). If you think you might be suffering from retinal vein occlusion and you live in the Huntington Beach, Los Angeles or Orange County area, contact us to make your appointment today. We want to help.